For this Beginners Guide we'll be fixing a cracked screen on a Lenovo T530 notebook. You'll want to find answers to each of the following questions for your specific notebook model. Do not assume the tech specs for a Lenovo T530 are the same as your notebook, they are not. Just replace all the Lenovo references for your particular notebook/model/specs. 1) What is the manufacturer and model number of the notebook? In our case, we're looking for the LCD screen panel for a Lenovo T530 series notebook. 2) What is the LCD screen size (in inches) and screen resolution (in pixels x pixels)? This Lenovo notebook model has a 15.6" screen, which is measured diagonally from corner to corner. Rather than measuring this, we looked up the tech specs on Lenovo.com for the answer. The T530 series laptop is sold in three resolutions: 1366x768, 1600x900 and 1920x1080. To find out which screen type is used for our notebook we'll have to connect the Lenovo T530 notebook to an external monitor via the notebooks' Analog VGA jack. By pressing Fn+F7 on the notebook keyboard, the computer will duplicate the screen onto the external display so we can actually use the computer - remember the cracked LCD screen just shows gibberish. 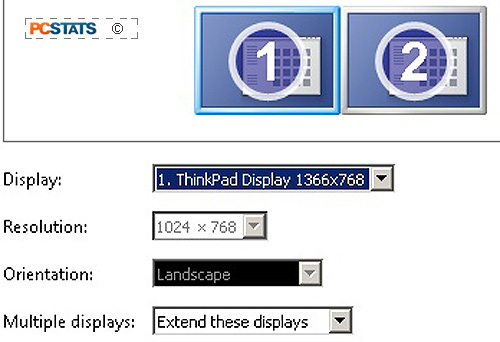 Next, we right-click on Windows Desktop > Screen Resolution > change 'Multiple Displays:' to "Extend these displays" > click on the #1 screen (or choose the notebook display from the 'Display:' drop down menu) and make note of the resolution value: 1366x768. If you make a mistake while in the Screen Resolution control panel or press 'Apply' and the window suddenly disappears to the broken screen, just wait 15 seconds.... if you don't click Okay to confirm the change the settings Windows will Revert back automatically. After following these steps we discovered that the Lenovo T530 notebook we're fixing has a 1366x768 resolution screen. 3) What kind of backlight does the LCD panel use? Cold Compact Fluorescent Light bulb (CCFL) or LED? There's no way to determine this information within Windows 7 or Windows 8. There's a slim chance this data may be listed in the notebook tech specs but you don't necessarily want to rely on that. In our example we're fixing a Lenovo T530 ThinkPad; it turns out this laptop may ship with a CCFL backlight in certain markets (ie. China) and a LED backlight in North American and European markets. To find out whether the screen uses an LED or CCFL backlight it's best to look at the actual LCD panel - even though we're 99% sure the answer is LED backlight. To do this we have to disassemble the notebook screen assembly, take a few photos to record where all the small wires are placed (this is important, do not skip this step), then remove the screws that hold the metal LCD panel frame to the back of the screen assembly and take a look behind. There are illustrated step by step instructions of how we did this later in the Guide. Looking at the back of the LCD panel we note how many wires are connected to it. In our case, there is one data cable. That indicates that this screen uses an LED backlight. 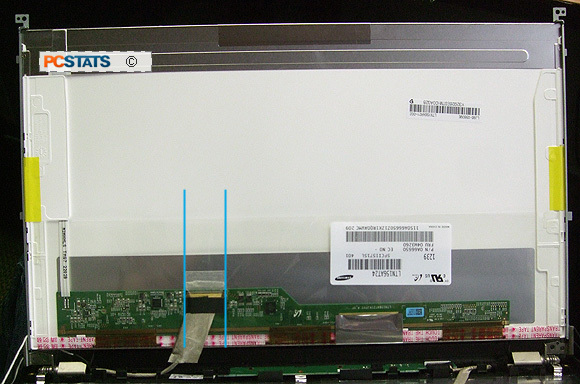 If this LCD panel used a CCFL backlight we would have seen the wide data cable and a separate pair of relatively thick white or light pink rubbery wires leading from the high voltage inverter to the CCFL bulbs at the top or bottom of the LCD panel. One data cable indicates to us that an LED backlight is in use. This is because LED backlights are powered by relatively low voltage DC (5V DC or possibly 12V DC). Whereas, CCFL bulbs require something like a 1kV or 3kv A/C power supply - hence the separate, well insulated wires running from the inverter which transforms the notebooks DC power to AC. 4) Record the LCD panel data cable pin count, connector placement(s), number of wires connected to the screen and part labels. While we have the Lenovo T530 ThinkPad screen partially disassembled, but before disconnecting a single wire, it's time to take a look around and record the information printed on the back. First we take a photo of the entire back of the LCD panel; this will gives us something to compare against when searching through replacement screens on Ebay. This photo also records all the part numbers on the identification stickers, which is information you may or may not need when searching through replacement screens. The other key bit of info we need is the location of the data cable connection. Potential replacement screens must have the data cable connection in same location (indicated by the vertical blue lines in the above photo). The wiring harness inside the laptop is just long enough to reach that spot and only that spot. In our case, the data cable connects at the bottom, just to the left of center when viewing the back of the panel head on. Next, take a close up photo of the data cable connector and record how many pins the connector has. We do this not by counting the individual pins, but by looking for two numbers silk-screened on the green PCB either side of the connector. Pin "1" will always be silk screened to one side of the connector and the last pin (whatever that number is) on the opposite. 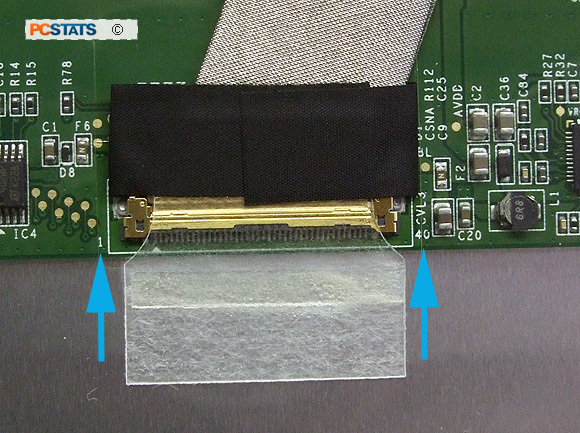 In this case we can see that our Lenovo T530 LCD panel uses a 40-pin data cable, as indicated by the miniature "40" silk screened to the right of the extremely compact flat cable connector which is maybe an inch wide.